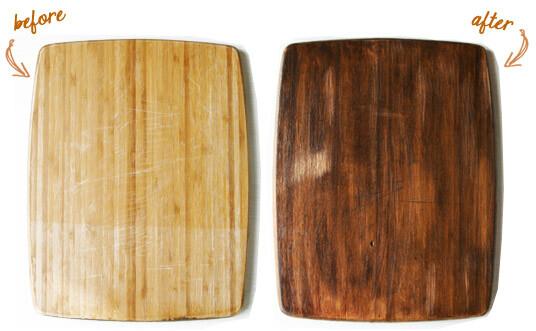 Cutting boards are extremely important to food photography as they give height and warmth to a picture. Unfortunately, most of the ones sold today are made of bamboo which while great for the environment and easy on the average knife show up a yucky yellow in photos which makes food look unappetizing. 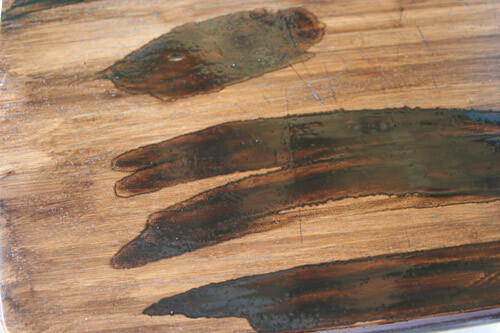 Gorgeous vintage cutting boards with scars, texture, and deep colors the camera loves are available for a pretty penny. You can get them online for anywhere from $20 before shipping to over $200. Which is why most of us make our own. Shawnda at Confections of a Foodie Bride has a wonderful tutorial on how to DIY it from scratch using inexpensive planks from the lumber yard. Her using a small hammer to soften the edges is pure genius. If your not married to a woodworker with a power saw, you can usually find extremely cheap cutting boards at Goodwill or the Salvation Army. I found 3 different sizes last weekend for 50 cents each. The problem is they were all yucky yellow. 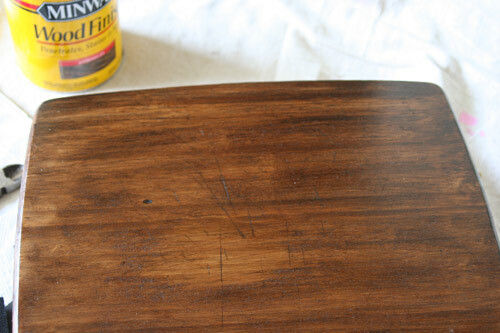 Shawnda also has a nifty solution for prematurely aging a honey-colored cutting board that uses steel wool, vinegar, and tea. The result is beautiful, but it does require letting things sit overnight, and I was looking for a super-speedy solution. Like done-in-10-minutes. I started by lightly sanding the board to remove the shiny finish. 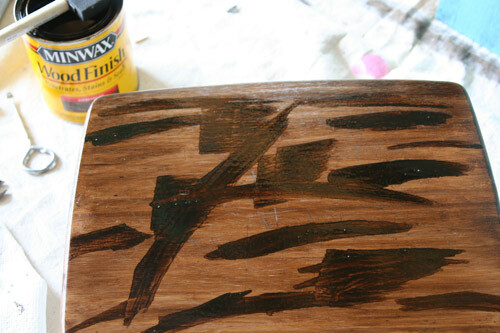 I then, with a 50-cent sponge brush, brushed on a thin layer of dark wood stain ($3 at the local hardware store). I was extra impatient, so I pulled out my hairdryer to hurry things along. Wiping away the streaks left the board lighter in places, but gave me great texture on the edges, so I did it again. With the help of my friend Hairdryer, and a couple new scuff marks from my other friend Sander, I had this in just about 15 minutes. And I was happy. It was still a tiny bit sticky, I’ll admit, but I was desperate to get a certain photo so I could finish a blog posting, so I immediately put it to work. 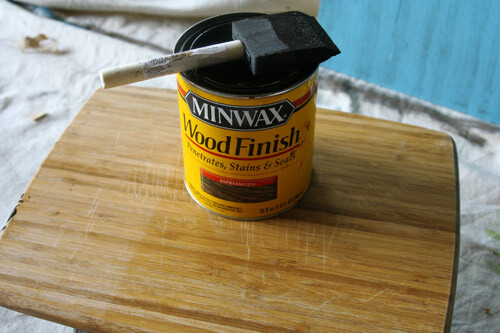 If you’re going to put finished food directly on the surface, you might want to use a food-safe finishing wax and allow it dry thoroughly overnight. But sometimes the food you want to photograph won’t wait. 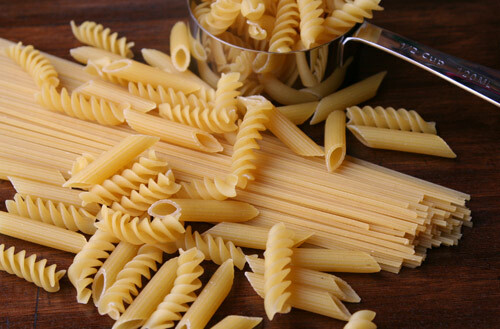 I was only taking a photo of dry pasta, and was delighted to get this and get back to my computer in no time. thanks for how to. want to make some antique looking ones myself and that is how I found you. PS thanks for other links too. checking those out.